Want to make the balloons float at your event? Unfortunately, air cannot do that but helium can! We have Helium Tank Rentals available in many different sizes to suit your event size and/or inflating needs in any city in Los Angeles County. Rent one of the helium tanks below to inflate the balloons at your event. Please remember that if you are inflating latex balloons, it is best to inflate them the same day as your event as latex balloons generally last 12-20 hours with helium. Foil balloons can be safely inflated the day before your event as they can last 5-7 days inflated. 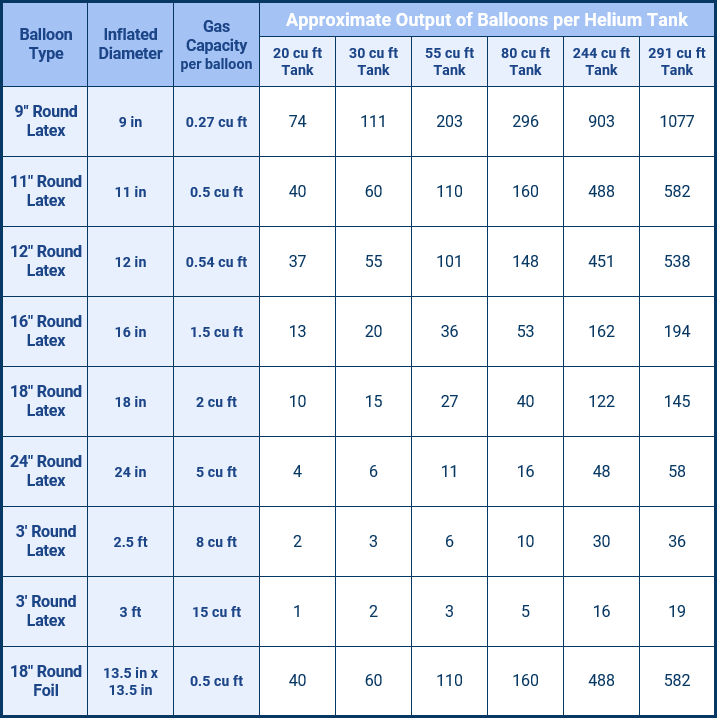 ​The following chart shows the Approximate Output of Balloons per Helium Tank Rental that we have available. Use the chart to choose the best size and amount of helium you need to inflate your balloons. If you need a larger amount of helium than we have in any one helium tank, consider combining 2 or more helium tanks in your rental order. Our 20 cu ft Helium Tank will fill about 40 standard size balloons inflated to 11". Our 30 cu ft Helium Tank Rental will fill about 60 standard sized 11" balloons. Our 55 cu ft Helium Tank Rental will fill about 110 standard sized balloons. Our 80 cu ft Helium Tank Rental can fill 160 standard sized balloons. Our 244 cu ft Helium Tank Rental can fill 488 standard sized balloons. Our 291 cu ft Helium Tank Rental can fill 582 balloons. Please keep in mind that these are estimates and actual output may vary. For specific helium requirements of the balloons you have, please see the balloon manufacturer. ​1. Put Balloon on Nozzle: Roll the opening of the balloon over the nozzle provided with your helium tank rental. Hold the balloon in place in the nozzle with your hand. 2. Press or Bend the Nozzle: This will release the helium quickly into the balloon. 3. Stop Bending or Pressing the Nozzle: When you've reached the size of balloon you want, stop bending the nozzle to stop the release of helium. Do not overfill balloons as they may pop. 4. Remove the Balloon from the Nozzle: Pinch the end of the balloon and pull it off of the nozzle. 5. Tie a Knot: Tie the neck of the balloon to keep the helium inside of the balloon! ​1. Put the Opening of the Foil Balloon on the Nozzle: Firmly hold the balloon over the nozzle. 2. Press or Bend the Nozzle: With the balloon firmly held in place, bend or press the nozzle to release the helium into the balloon. 3. Stop Pressing the Nozzle: To stop the release of helium when the foil or Mylar balloon looks mostly smooth. Some wrinkles may remain but will smooth out over time. DO NOT over inflate of the balloon will pop. 5. Add a Ribbon: Add a ribbon through the hole provided below the opening only. If you tie a ribbon around the valve as you might with a latex balloon, helium may escape from the balloon. ​If properly and carefully deflated, some foil or Mylar balloons can be stored to use for future events. Follow the instructions below in a well-ventilated area if this is something you would like to try. 1. Use a long, hollow balloon stick or drinking straw to release the helium from the balloon: Carefully insert a hollow balloon stick or long drinking straw (8”+) into the balloon opening, past the self-sealing tab of the balloon. You’ll feel and/or hear helium being released through the straw when you’ve passed the self-sealing tab. Once this happens, do not push any further as you may damage the balloon. 2. Push helium out of the balloon through the stick or straw: Gently apply pressure to the balloon to help the helium escape from the balloon while keeping the straw in place through the opening. As helium is escaping, gently fold or roll the balloon starting from the side farthest away from the opening to get all the helium out. 3. Fold Your Balloon Flat: Once all the helium is released, gently pull out the stick or straw and fold the balloon flat. 4. Store the Balloon: Store the balloon in a container where it will not be easily damaged. Keep the balloon indoors at room temperature. Do not expose the balloon to direct sunlight or heat as the balloon will get damaged and be unusable in the future. ​Helium is a lighter-than-air, non-toxic, odorless, colorless, tasteless and nonflammable gas. However, caution MUST be used when handling Helium or any Helium Tank. Some Helium Tanks are large and heavy and require care and caution while in your possession. Improper or careless handling can cause Helium Tanks to fall over and burst, leading to possible damage of property, bodily injury to yourself and others. DO NOT leave Helium Tanks unattended around children, pets or others. Helium Tanks should not be used by children or impaired persons. Helium is an asphyxiant gas which means it could cause unconsciousness or death by suffocation if released in a confined space. Use Helium and Helium Tanks ONLY in a well-ventilated area. DO NOT inhale Helium as it can cause injury or death by displacing the oxygen in air, causing suffocation. DO NOT place or allow the Helium Tank Nozzle to be placed in your or any mouth or nose for any reason. Doing so can damage lungs and other body parts which can result in serious bodily injury or death. DO NOT expose any Helium Tank to direct heat or fire. The Helium in our Helium Tanks is intended to be used ONLY for inflating balloons. DO NOT refill any Helium Tanks with any other gas or substance or use them for anything other than its intended purpose. Please be aware balloons are a choking hazard. People, especially small children under 8 years old, can choke on uninflated or broken balloons. Keep uninflated balloons away from children and discard any broken balloons immediately. Responsible adult supervision is required when any Helium Tank Rental is included in your order and is the Renters’ absolute responsibility.